It’s one year ago today that Prime Minister Theresa May triggered the Article 50 notice for the UK to leave the EU. 29 March 2017 will not be celebrated in history. It’s the day that Britain’s interests were betrayed. Almost all of Theresa May’s current cabinet said during the EU referendum campaign that Brexit would damage Britain, make us poorer, put our security at risk, and could undo our own union of the four countries of the United Kingdom. But the Prime Minister and her ministers went ahead with Brexit anyway, against their own strong advice to the nation not to. 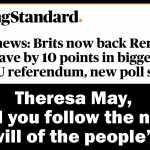 SHE’S GONE AND BLOODY DONE IT – the one thing she said just one year ago would not be in Britain’s best interests. She’s triggered Brexit. 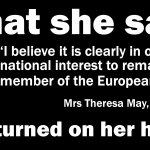 Theresa May has gone against her own advice that Britain shouldn’t leave the EU. Not just her advice. But the strong advice of 70% of her cabinet ministers, who also less than a year ago urged the country not to Brexit. Why are they doing it? Because people told them to? Does that make any sense? If people told you to jump off a cliff, would you do it? Would you volunteer to do it? Because Mrs May and most of her cabinet have volunteered to do something they all said would be bad for Britain. In doing so, they are betraying our country. They are doing something that, by their own admission, will not be in the nation’s best interests, but on the contrary, most definitely against our interests. 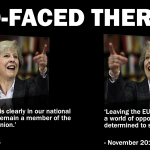 Two-faced Theresa today formally wrote to the European Union to trigger Article 50, starting two-years of gruelling divorce proceedings that could forever ruin our relations with the mainland of our continent. And there were other serious risks too. 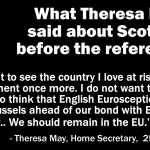 In addition, Brexit might prove fatal to “the Union between England and Scotland”, which she did not want to happen. And if Britain left the EU, she argued, we might not be successful in negotiating a successful divorce settlement. She added, “The reality is that we do not know on what terms we would win access to the single market. “We do know that in a negotiation we would need to make concessions in order to access it, and those concessions could well be about accepting EU regulations, over which we would have no say, making financial contributions, just as we do now, accepting free movement rules, just as we do now, or quite possibly all three combined. 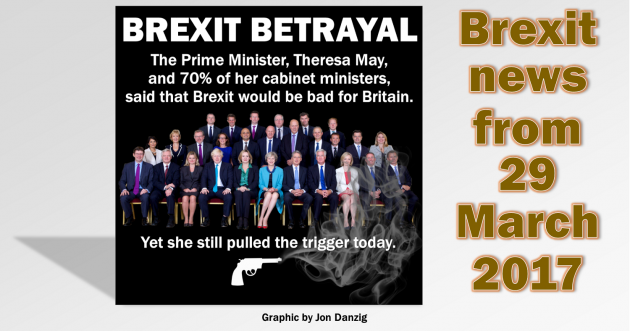 Most of Theresa May’s cabinet were of the same view: Leaving the EU would be against Britain’s interests, it would represent a disaster for our country. • Chancellor of the Exchequer Philip Hammond said: We will be safer, stronger and better off if we remain in the EU. • Home Secretary Amber Rudd said: I passionately believe it is best for us all and our country if we remain a member of the EU. • Justice Secretary Liz Truss said: I don’t want my daughters to grow up in a world where they need a visa or permit to work in Europe. • Defence Secretary, Michael Fallon said: Make no mistake – a vote to Leave would be payday for Putin. • Health Secretary, Jeremy Hunt said: We will be better off and more secure by remaining in the European Union. • Education Secretary, Justine Greening said: Staying in the EU is smart diplomacy and smart economics. • Culture Secretary, Karen Bradley said: If you want a stronger, safer, better off Britain, then the positive choice is to vote Remain. • Work and Pensions Secretary Damian Green said: Leaving the EU would cause huge economic damage. And so on, ad nauseam. The Prime Minister, and the majority of her government ministers, strongly urged Britain to remain in the EU in the interests of the country’s prosperity and security. So, what’s happened to them all? Were they stupid then and clever now? Before the referendum, these politicians said what they sincerely believed to be in the best interests of Britain. But after the referendum, these politicians are saying and doing what they insincerely believe will be in the best interests of themselves. Future history books will have a collective noun for them. Hypocrites. Fortunately, it will prove to be their downfall. Unfortunately, it’s likely to lead to our country’s downfall too. 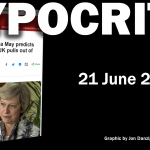 Mrs May: Acting against the national interest? This entry was posted in Democracy & Citizenship, The EU and tagged 29 March 2017, Article 50, brexit, EU referendum, Theresa May, Tories. Bookmark the permalink.